A re-enactment of Allan Kaprow's Push and Pull: A Furniture Comedy for Hans Hofmann 1963 (with thanks to the Allan Kaprow Estate). Coordinated by Lucas Ihlein. 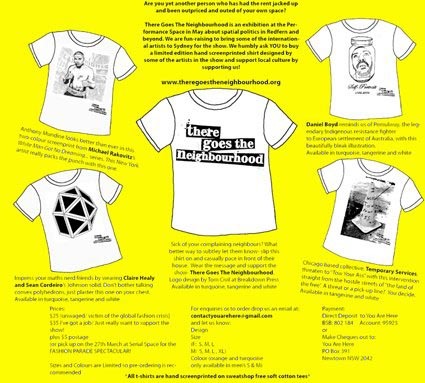 The Free Association will undertake a dialogue project in response to There Goes The Neighbourhood. For details click here. "There Goes the Neighbourhood is an exhibition, residency, discussion and publishing project for May 2009. The central element of this project will be an exploration of the politics of urban space, with a focus on Redfern, Sydney. The project will examine the complex life of cities and how the phenomenon of gentrification is altering the relationship between democracy and demography around the world. While urban change itself is not always a bad thing, gentrification often happens at an accelerated rate, out pricing the lower income and marginalized communities from the neighbourhood and dislocating them from their existing connections to urban space. The project brings togther artists from Australia and around the world whose work addresses these issues". We would like to acknowledge the traditional owners of this land, the Gadigal people.